Easter Monday is always the day after Easter Sunday and is a day of remembrance of Christ's resurrection. 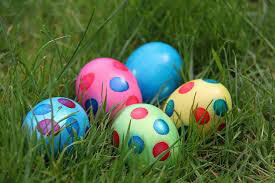 People will often take part in Easter egg hunts and gift chocolate eggs to family members. For many this is the end of a 4 day weekend where they return from a short vacation trip camping or to the beach. This day traditionally was a bad luck day and referred to as Black Monday but more recently it has changed to a day to relax and take part in Easter related activities.